Age spots(brown Spots) also knows as sun or liver spots are small, round and flat spots which may appear on any skin area mostly exposed to sun. These tiny brown or black spots usually appear on your face, hands, arms and shoulders because all of these skin areas are often exposed to direct UV Sun rays. Age spots are quite common in people of age greater than 50's but people of early 40's even 30's may also get these spots if they spend a lot of time in the sun. Although age spots have appearance similar to skin cancerous growth but true age spots are harmless and don't require a medical treatment. However if you observe a change in their size or color then you must consult your problem with a medical doctor because these changes can be signs of melanoma, a serious form of skin cancer. Age spots are usually caused by skin damage due to ultraviolet (UV) light from the sun. UV sum rays increase the production of skin pigment melanin, creating a tan that helps protect deeper layers of skin from UV rays. Age spots appear on those areas of the skin that have years of frequent and prolonged sun exposure and when melanin becomes "clumped" or is produced in particularly high concentrations then such conditions give rise to production of age or brown spots. An other important cause for age spots is impaired liver function. As we age, our metabolism changes and the liver can become overwhelmed with toxins. If the liver cannot rid the body of these toxins, age spots (liver spots) can begin to develop. Oxidation within the body and a lack of anti-oxidants in your diet can also play an important role in the formation of age spots (brown spots) or liver spots. There is no doubt that Natural skin bleaching products really help a lot in reducing the appearance of age spots but preventing age spots — by avoiding the sun and using sunscreen and by eating foods rich in anti-oxidants may be the easiest way to maintain your skin's youthful appearance. 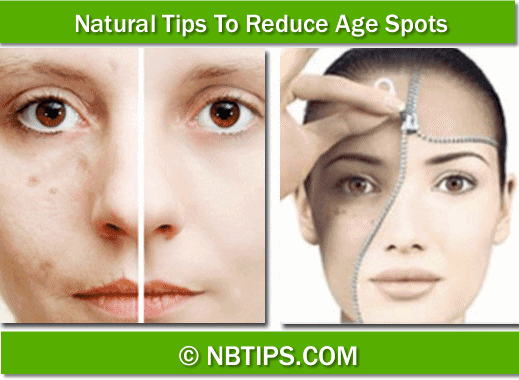 However, here we have some best natural beauty tips to lighten the appearance of age spots. Lemon Juice is one of the best natural skin bleaching agent and has been shown excellent results in reducing dark spots as well as brownish age spots. Simply rub the freshly cut lemon piece on affected areas and massage at least for 5 minutes. Let the juice absorb into your skin and leave at least for 20 minutes. Finally wash off with fresh water and pat dry your skin. For best results repeat this process twice a day until you get the desired results. (While applying lemon juice don't go out in sun as as it increases the skin's sensitivity to sunlight). A mixture of apple cider vinegar and lemon juice is also very beneficial in getting rid of age spots. Mix equal quantities of apple cider vinegar and lemon juice and then apply this mixture on your age spots with help of a cotton ball. Leave there at least for 20 minutes and then wash off. Take equal quantities of Apple cider vinegar and onion juice. Mix them well and apply this mixture on your age spots. Now massage for few minutes and then leave for about 30 minutes and then wash off. For best results repeat this on a daily basis until your get the desired results. A mixture of apple cider vinegar and olive oil is also very helpful in elimination of age spots. Apple cider vinegar help in skin exfoliation while olive helps in regeneration of new skin cells. Mix one tablespoon of apple cider vinegar with equal quantity of olive oil and apply this mixture to the spots. Massage for about 5 minutes and then wash off after 20 minutes. This should then be washed off with water after half an hour. An other way to fade away the age spots is a mixture of apple cider vinegar and orange juice. Take 2 tablespoons of orange juice and mix with 1 teaspoon of apple cider vinegar and apply this mixture to your dark spots. Let this mixture absorb into your skin and then wash off after 20-30 minutes. Aloe Vera gel or juice, both are highly effective in getting rid of age spots. Gel or juice obtained from Aloe Vera can be directly rubbed on spotted regions to eliminate them. It stimulates the growth of new skin to replace old, dead cells and hence helps a lot in reduction of age spots as well as rejuvenates your skin's appearance. Leave aloe vera gel or juice on affected regions at least for 30 minutes and then wash off. Application of castor oil is also very beneficial in reducing the appearance of age spots. Simply massage the oil directly onto the affected skin areas once in the morning and once in the evening. For best results, repeat this process on a daily basis. A mixture of buttermilk and tomato juice is also very effective in elimination of age spots. Buttermilk has lactic acid in it, which helps to restore and rejuvenate the skin while tomato juice helps in getting spotless and glowing skin. Simply mix 2 tablespoons of buttermilk with 1 tablespoon of tomato juice and apply this mixture to your age spots. Let this mixture into your skin and then wash off after 20-30 minutes. To reduce the appearance of age spots mix 1 tablespoon of lemon juice with equal amount of tomato juice and apply this mixture directly on your age spots. Leave this for about 20 minutes and then wash off. For best results repeat this process on a daily basis. Skin Bleaching properties of both cucumber and lemon juice are highly beneficial in removal of age spots. Mix equal amounts of cucumber and lemon juice and directly apply onto the affected areas. Wash off after 20 minutes. Regular application will show you an excellent result within few days. Papaya helps in reduction of age spots by skin exfoliation. Papaya not only aids in reduction of age spots but also helps a lot in getting a cleaner and brighter skin. Take a small piece of fresh papaya or simply rub one tablespoon of fresh grated papaya on the age spots. Leave it on for about 20 minutes and then wash off with lukewarm water. For best results repeat this process twice daily until the age spots fade away. Note: As some people can be allergic to papaya, it is advisable to do a small patch test on any skin area and wait for few hours. If it creates any allergic reaction then avoid the use of papaya. A mixture of whole milk yogurt and turmeric is also very beneficial in getting rid of age spots. Lactic acid in yogurt and skin bleaching properties of turmeric, both are highly effective in spot reduction. Take 1 tablespoon of yogurt and mix with 1/4 teaspoon of turmeric powder. Now apply this mixture directly on your age spots and massage for few minutes. Leave it on for about 20 minutes and then wash off with lukewarm water. Regular application will give you an amazing result within few days.